A bald eagle sits on a nest near Barnet along the Connecticut River. Vermont’s 16 known bald eagle nests produced 26 young this year. Photo by John Hall, VT Fish & Wildlife. 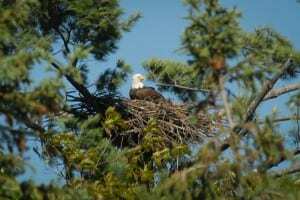 Bald eagles in the state had a very good nesting season in 2013, according to a report from Vermont Fish & Wildlife Department and Audubon Vermont. From 16 known nests, Vermont’s bald eagles produced 26 fledglings, or offspring that survived to leave the nest. This is an increase from 2012, when 24 fledglings were produced. 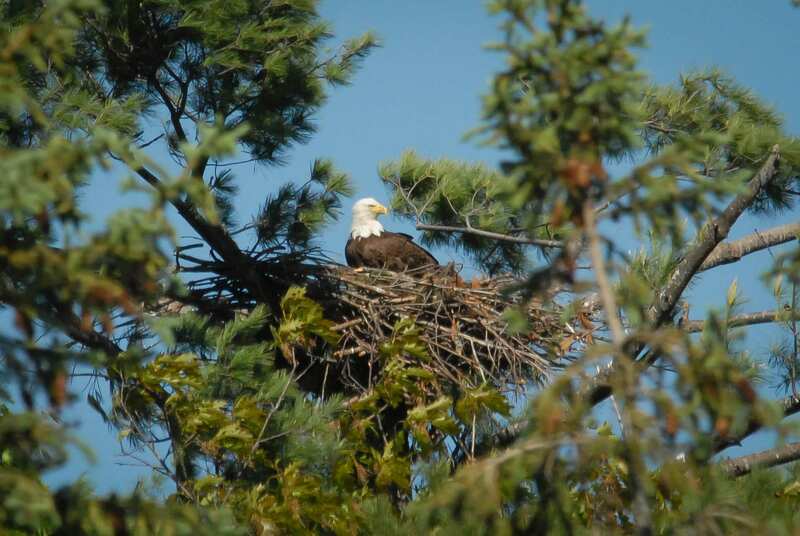 Buck urged Vermonters to appreciate eagle nests from a distance. “Bald eagles at nest sites are very susceptible to disturbance, so giving eagles their space while they’re nesting is one of the best ways Vermonters can help these birds during nesting season.” Bald eagles are no longer a federally endangered species, but they are still listed under Vermont’s Endangered Species Act. Other bird species monitored by the department and its Vermont partners fared well this nesting season. Common loons and peregrine falcons, which were removed from state endangered species lists following years of stable populations, both posted high numbers of offspring. Common terns experienced a record nesting year with 260 nests documented from only two known nesting sites on Lake Champlain. Vermonters can help researchers in their effort to conserve birds by donating to the nongame wildlife fund on line 29 of their tax return or at www.vtfishandwildlife.com, or by purchasing a conservation license plate.